The FT-330 is a highly accurate Hall Effect flow meter designed for low flow OEM applications. This low cost NSF listed flow meter is ideal for liquid-based applications. The 316SS shaft allows for accurate measurements during quick cycles. 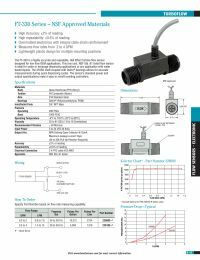 The sensor’s standard power input and output specifications make it easy to add-on to existing applications.